If you have indulged in sweets when stressed or upset, you know how immediately satisfying they can be but are all too often followed by a blood sugar crash and irritability. But just like some foods can have a negative effect on your outlook, recent research is exploring whether eating certain foods can improve your mood and well-being. Growing evidence suggests that omega-3 fatty acids (abundant in oily fish such as sardines, salmon, and mackerel) may have a role in brain functioning, with deficiencies in omega-3 fatty acids linked to mental health problems. In a study published in the Journal of Epidemiology and Community Health, for instance, researchers analyzed 26 previously published studies (involving 150,278 participants) that examined the association between fish consumption and the risk of depression. In their analysis, the review's authors found that people who consumed the most fish were less likely to have depression symptoms. While this association doesn't prove causality, it suggests that rigorous clinical trials are needed to explore the role of omega-3 fatty acids in depression and mental health. Foods to Eat: To up your intake of omega-3 fatty acids, look to oily fish such as wild Alaskan salmon, sardines, anchovies, and mackerel. Plant foods rich in omega-3s include walnuts, canola oil, and purslane (an herb). In addition to whole foods, good sources of omega-3s are fish oil, flaxseed oil, and echium oil, but it's a good idea to check with your healthcare provider first if you are pregnant, nursing, take medication, or have any concerns. Probiotics are best known for their role in digestive health, but emerging research suggests that bacteria in the gut sends and receives signals to the brain (known as the "gut-brain axis). In a review published in Annals of General Psychiatry in 2017, researchers analyzed 10 previously published studies and found that the majority of studies found positive effects of probiotics on depression symptoms. While promising, the study's authors noted a wide variation in probiotic strain, dose, and treatment duration. Consumption of a probiotic supplement was found to improve both gut symptoms and depression in people with irritable bowel syndrome (IBS), according to a study published in Gastroenterology in 2017. Participants took either a probiotic supplement (Bifidobacterium longum NCC3001) or a placebo daily for 10 weeks. After six weeks, 64 percent of those taking the probiotic had decreased depression symptoms, compared to 32 percent of those taking the placebo. What's more, the improvement in depression symptoms was associated with changes in the activity in brain areas involved in mood. Foods to Eat: Yogurt is the best-known source of probiotics, but the beneficial bacteria can also be found in kefir, buttermilk, and fermented vegetables such as sauerkraut, Korean kimchi, miso, tempeh, and pickled vegetables. Whole grains are important sources of B vitamins, nutrients vital for brain health. For example, thiamin (vitamin B1) is involved in turning glucose into energy, vitamin B5 is needed to produce the neurotransmitter acetylcholine (involved in learning and memory), vitamin B6 helps to convert the amino acid tryptophan into serotonin, and vitamin B12 is involved in the production of neurotransmitters. Foods to Eat: Whole grain foods can be confusing. A rule of thumb when reading food labels is that for every 5 grams of carbohydrate, a product should have at least one gram of dietary fiber. Look for grains in their whole form, such as steel-cut oatmeal, quinoa, brown rice, amaranth, millet, bulgur, and wild rice. Eating breakfast regularly is associated with fewer depressive symptoms, according to some researchers. A 2017 study published in Appetite, for instance, analyzed the survey responses of 207,710 people aged 20 years and over and found that those who said they ate breakfast "seldom" or "sometimes" had higher depressive symptoms than those who ate breakfast "always." While the association doesn't prove that the depressive symptoms were caused by skipping breakfast, it suggests a possible role of regular breakfast on mood that should be explored further. Foods to Eat: Choose foods rich in fiber, nutrients, and good fats. Oatmeal is rich in soluble fiber, which helps to smooth out blood sugar levels by slowing the absorption of sugar into the blood. 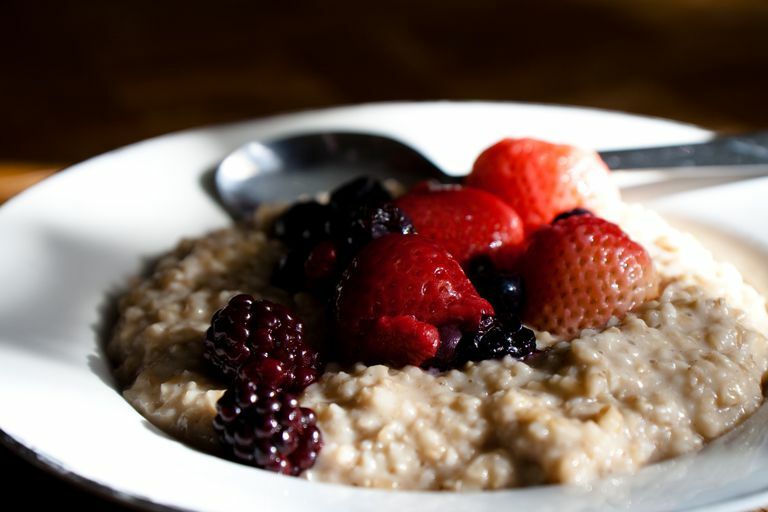 Try a bowl of steel-cut oats. Other breakfast foods to include are citrus fruits, strawberries, apples, whole grains, and nuts. Spinach and other green vegetables contain the B vitamin folate. Although the connection isn't fully understood, low folate levels have been consistently associated with depression in research. A study published in the Journal of Psychiatric Research in 2017, for instance, analyzed previous studies and found that people with depression had lower blood levels of folate and lower dietary intake of folate compared to those without depression. Folate deficiency may impair the metabolism of serotonin, dopamine, and noradrenaline (neurotransmitters important for mood), but further research is needed to understand the role of folate in depression and mental health. Several studies have found that greater vegetable and fruit consumption is associated with a decreased risk of depression. Foods to Eat: Folate-rich vegetables include spinach, edamame, artichokes, okra, turnip greens, avocado, and broccoli. Folate is also plentiful in beans and lentils, with a cup of cooked lentils providing 90 percent of the recommended daily allowance. Don't take folic acid supplements without consulting your health care provider. In some cases, it may cause adverse effects and there are potential risks for some people (such as those who have had colon polyps or cancer). Caffeine has been found to trigger the release of brain chemicals such as dopamine, which is important for performance and mood. A study published in Molecular Nutrition and Food Research in 2016, for instance, analyzed 12 previously published studies and concluded that coffee consumption (and to a lesser extent, tea) had a protective effect on the risk of depression. Beverages to Drink: In the study above, the intake that had the greatest effect was 400 mL of coffee (approximately 1 2/3 cups) per day. Caffeine affects everyone differently, so if coffee makes you jittery, irritable, sad, sleepless, or brings on other adverse effects, avoid drinking it (opting for caffeine-free beverages like rooibos tea) or choose lower-caffeine beverages like black tea or green tea. Another option: chai. An Indian tea made with regular black tea plus spices such as cardamom and cinnamon, chai's spices also add a natural sweetness to the tea, which may help you cut back on sugar and sweeteners. Known as the sunshine, vitamin D is made naturally in the body when skin is exposed to the sun's ultraviolet B (UVB) rays. In the past few years, research has suggested that vitamin D may increase the levels of serotonin, one of the key neurotransmitters influencing our mood, and that deficiency may be linked with mood disorders, particularly seasonal affective disorder. In addition, preliminary research suggests that vitamin D deficiency is a risk factor for depression in older adults. Some people are at greater risk for a vitamin D deficiency. Darker skin, for instance, has more melanin, a substance that blocks ultraviolet rays. Working indoors during the day, living further from the equator, or being in an area with greater air pollution also increase your risk of vitamin D deficiency. Foods to Eat: Canned salmon with bones is rich in vitamin D and is also a source of omega-3 fatty acids. Look for Alaskan pink salmon or sockeye salmon with bones. Other foods include cheese and egg yolks. Foods that may be fortified with vitamin D include milk, soy milk, and orange juice. Small dietary changes can make a big difference in how you feel over time. While the research on food and mood is in the early stages, many of these foods can keep you healthy for other reasons. It may be tempting to use food to treat anxiety or depression, but more research is needed from large-scale clinical trials. If you have depression or any condition, it's important to seek help from your health care provider. Lee SA, Park EC, Ju YJ, et al. Breakfast Consumption and Depressive Mood: A Focus on Socioeconomic Status. Appetite. 2017 Jul 1;114:313-319. Pinto-Sanchez MI, Hall GB, Ghajar K, et al. Probiotic Bifidobacterium Longum NCC3001 Reduces Depression Scores and Alters Brain Activity: A Pilot Study in Patients With Irritable Bowel Syndrome. Gastroenterology. 2017 Aug;153(2):448-459.e8. Wallace CJK, Milev R. The Effects of Probiotics on Depressive Symptoms in Humans: A Systematic Review. Ann Gen Psychiatry. 2017 Feb 20;16:14.